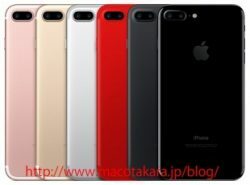 Apple will release updated versions of the iPhone 7 and iPhone 7 Plus next year, aptly called the "iPhone 7s" and "iPhone 7s Plus," according to Japanese blog Mac Otakara. The report claims the smartphones will retain the same aluminum design as the iPhone 7 and iPhone 7 Plus, with only internal changes, including the addition of a faster A11 chip. The report added it is highly probable the iPhone 7s and iPhone 7s Plus will come in an all-new red color alongside current Black, Jet Black, Gold, Rose Gold, and Silver options. Multiple rumors suggest Apple plans to release three new iPhone models next year, including updated 4.7-inch and 5.5-inch models with traditional LCD displays and a larger premium model with an OLED display and glass casing, but reports have been conflicting about which features will be included on each model. If this report is accurate, it could signify Apple's plans to release a completely overhauled glass-backed iPhone with a curved, bezel-free OLED display and wireless charging at the high end of its 2017 smartphone lineup, while making only incremental upgrades to its traditional 4.7-inch and 5.5-inch iPhones with LCD displays. An earlier report from Japanese website Nikkei Asian Review said Apple plans to release three glass-backed iPhones next year, while it was said the 4.7-inch iPhone would get wireless charging, so there remains a lack of consensus among rumors—perhaps unsurprising given new iPhones are likely over nine months away. Mac Otakara was first to report about Apple's plans to remove the headphone jack and add a new Jet Black color for the iPhone 7 lineup, but its track record is not perfect. Its rumor from November about Apple adding a "Jet White" color for iPhone 7 and iPhone 7 Plus has also yet to materialize. Please tell me they are joking? Please... if there's no major update after THREE years of the same design then I'm pretty sure this company wants to commit suicide. Literally the opposite of what jobs would have done. I hate this Apple. Correction: iPhone 6, iPhone 6 Plus, iPhone 6s, iPhone 6s Plus, iPhone 7, and iPhone 7 Plus. New color is just a marketing gimmick to make customers identify an old design as the newest version. I think this rumor is total BS. This rumor doesn't align with everything else we've been hearing. I don't think we'd see a 7S, as the 7 is just a 6SS, for the iPhone's 10th anniversary. Then again, Apple has been disappointing lately.